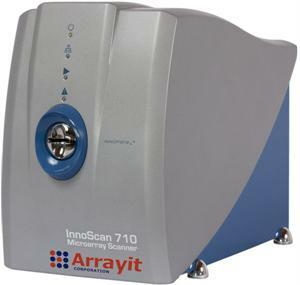 ArrayIt® InnoScan® 710 and 900 microarray scanners are the fastest high-resolution 2 color confocal fluorescent microarray scanners available. Dual detection channels allow two-color scanning of an entire glass substrate slide in minutes and 24 substrate slides in a fully automated manner using the InnoScan® 710AL and 900AL. 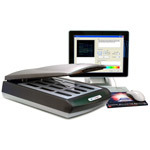 Scanning resolution is fully adjustable, making these scanners ideal for high-, medium- and low-density microarrays. Dynamic auto focusing guarantees uniform scanning across the entire chip surface. Mapix® Software allows real-time adjustment of scanning intensity, easy channel balancing, data quantitation and data export. These network compatible Windows and Linux systems are the most compact laser scanners on the market. 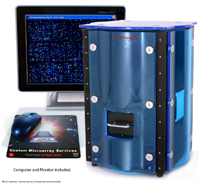 All 710 and 900 systems can be configured with custom lasers, filter sets, optics, substrate holders and other custom accessories to accommodate laser scanning of diverse microarray substrates. These custom systems are also highly conducive to the development of novel devices and assays.